FOR NATIVE INSTRUMENTS KOMPLETE KONTROL NKS 1.5 and up. 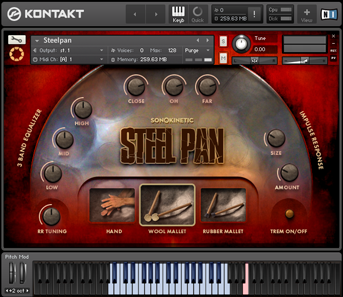 FOR NATIVE INSTRUMENTS KONTAKT AND KONTAKT PLAYER 5.7.1 and up. SONOKINETIC PROVIDES TUTORIALS AND VIDEO FEATURES TO HELP YOU GET ALL THE INFORMATION YOU NEED TO WORK WITH OUR TOOLS. 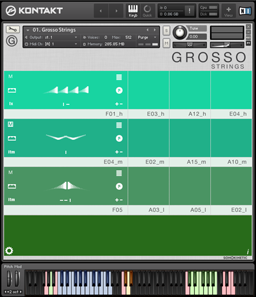 EXPLORE OUR VIDEO CHANNELS FOR MORE IN-DEPTH INFORMATION ON OUR COMPOSING TOOLS. Ever since we recorded and produced ‘Carousel’ several years ago, we’ve been hearing so many positive reactions about it, and about the need for ‘couleur locale’ like this. Loving Carousel as much as we do, we decided to do an encore, a sequel if you wish. We infused this new instrument with a lot of the things we’ve learned and perfected over the years. Our scripting mastermind Ken Black added an ingenious script to glue it all together and make it feel and play as it should in proper Sonokinetic fashion. For the recording we went back to Hilversum in the Netherlands and booked the same studio we used for Celesta. We teamed up with A.W. de Vogel, who comes from a long lineage of prolific organ-men in the lowlands. He brought along two of his most cherished barrel organs, a small hand operated one, and a larger one powered by an electric motor, that we barely got through the studio entrance. The organs made some waves in the ‘Muziekgebouw van de Omroep’. These instruments have a tremendous ability to move people. Maybe it’s a Dutch thing, I don’t know, but it was very interesting to me how such a ‘mechanical’ instrument turned out to invoke so many emotions in so many different people. There is a certain kind of magic that radiates from the wooden dolls, the creaky mechanics, the lacquered cardboard piano rolls and the skilfully painted front. These instruments are meant to bring joy… and that they did! 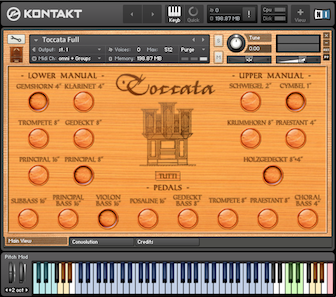 In order to help convert this joy to a Kontakt instrument we tried to adapt some of the functionality of the original instrument to the digital equivalent. We thought of the mechanical runs that permeate proper barrel organ music, and found a way to do that with the pitch wheel, and trills with the mod wheel, which all felt very natural to us. The ‘melody double’ function makes it very easy to play your melodies in octaves, and for the large organ we recorded the original tremolo effect. All in all we feel we delivered an inspirational instrument with ‘The Carnival’ that not only sounds the part, but also makes it very easy to play ‘authentic’ material, and all the while being great fun in the process. Relive fond memories of fairgrounds and boardwalks, or a trip to the canals of Amsterdam, with this one of a kind Kontakt version of a timeless classic. 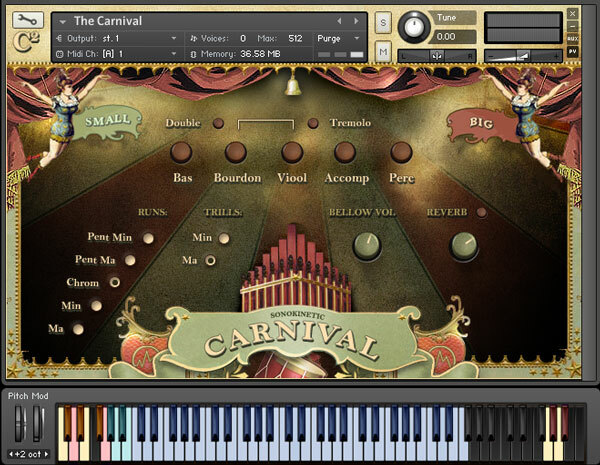 The main user interface for ‘The Carnival’ contains all the controls within one screen. Both sizes of organs and all registers can be accessed. Buttons for octave doubling and sampled tremolo can be activated. There are also controls for tempo-synced trills and runs. Bellow and reverb amount can also be adjusted. 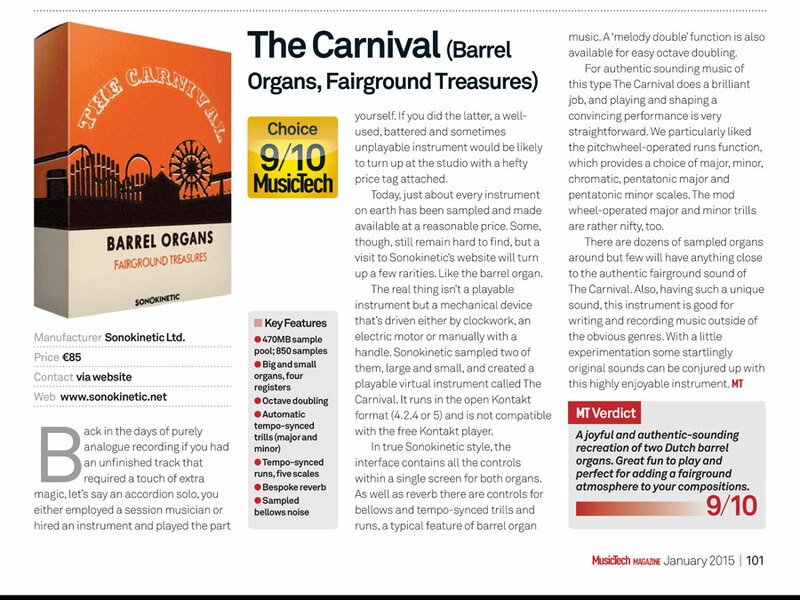 The first thing to notice with The Carnival is that we have sampled two completely different barrel organs, both large and small. Either organ can be selected with the SMALL or BIG buttons on the far left and right of the interface. The small organ has registers Bas, Bourdon, Viool and Piccolo. The large organ has registers Bas, Bourdon, Viool, Accomp and additional Percussion. With both organs the various registers can be turned on or off by clicking the corresponding button on the interface shown above. The playable range of the instrument depends on which registers have been selected. 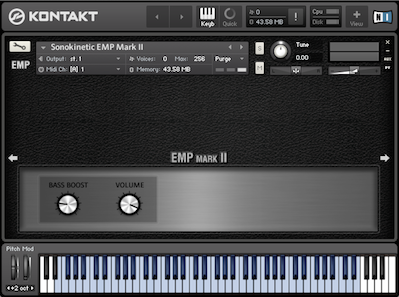 The blue keys on the Kontakt keyboard show the playable range of the tonal registers. The very light blue keys from G#0 to B0 show the playable range of the percussion section. We have maintained the character of our sampled organs by capturing all the nuances of the original instruments. The samples include all of the character and noises from the organs which will ensure that your organ parts sound as realistic as possible. typically within 48 hours of your request. and studios are opened on European business hours.